A few years ago, it seems like classic hats (fedoras and trilbies and the like) were making a comeback — no doubt due to one of our very first posts: “Bringing Back the Hat.” As with all fads, it seemed to fade away as quickly as it arrived, leaving classic hats right back to where they were before — worn by men like myself who like the tradition and the way they look and really don’t care about whether they’re “cool” or not. Partial responsibility for the fizzling of the hat resurgence can be traced to the fact that men starting picking up their lids at retailers like Target. While they could be had for cheap, they looked cheap, with none of the classic handsomeness that made hats of old such an attractive accessory in the first place. A hat is like a watch or a suit — the kind of thing you want to shell out a few more bucks for in order to get something that’s top quality. Don’t cut corners when buying a hat — visit a local shop dedicated to hats, find one that looks great on you and works for your mug, and buy the best. Sure it costs more initially, but by taking good care of your hat it can last your whole life, ultimately giving you more bang for your buck than something that looked bad from the get-go and is going to fall apart in five years. When putting your hat down on a flat surface, lay it upside down on its crown, not on its brim. Leaving it on its brim will cause it to flatten out and change shape. You can also hang your hat on a hat rack or peg. Make sure the peg or hook is wide enough to not create a dimple in the hat. If your hook seems too sharp, cut a slit in a tennis ball and slip it over the hook to create a wider platform. Do not store your hat on a peg for long periods of time as the force of gravity pulling on the hat can change its shape. If you plan on storing your hat for an extended period of time, then it’s best to place the hat in a hat box which supports both the brim and crown. Store the box in a cool, dry place, as both heat and moisture can damage your hat. But beware of moths making a snack of your topper — use lavender or cedar (a good, manly smell) to keep these buggers at bay. Loose dirt. If your felt hat is looking tired and dirty, take a brush to it. Use a horsehair brush, as those made with nylon bristles can be too abrasive for felt. A soft shoeshine brush can do the trick or you can buy brushes especially made for hats. Get a brush with light-colored bristles for use on a light-colored hat and vice versa for dark hats, as the color of the bristles can sometimes transfer to the hat. Gently brush your hat with the nap in small, counter-clockwise motions. Even when you can’t see the dirt, give your felt hat a regular brushing; it will prolong its life. Dust. Wipe with a slightly damp cloth. Hair and fuzz. If your hat is covered with pet hair or fuzz, wipe it gently with a piece of tape. Wrap it around your fingers, sticky side out, and sweep it gently across the hat. Smudges and stains. For a stain on a felt hat, start off by taking a gum eraser or a rubber sponge (like a make-up sponge) to the mark or smudge. There are also sponges made especially for hats and dry cleaning sponges can do the trick as well. If the stain or smudge persists, try a cleaner made for hats like Scout Hat Cleaner. You spray it on, wait for it to dry into a powder, and then brush it off. For a grease stain, you can also try rubbing some cornstarch into it and then brushing it off. For a straw hat, use ivory soap and a wet cloth and gently rub the stain. Handle it by the brim, not the crown. I’ll admit that I like doffing my hat by grabbing it by the crown. It just looks cool. But unfortunately, while it may be suave, it’s no good for your hat. All that pinching will weaken the crown’s ability to holds its shape or create a crease that can’t be fixed. Oils and dirt from your hand will also soil the hat. 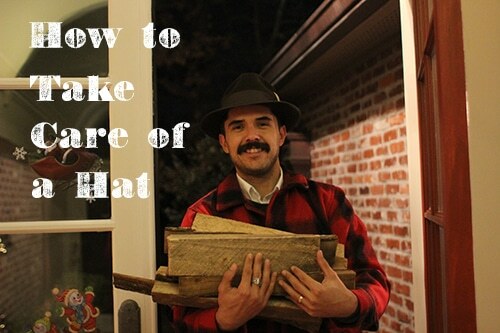 Take off or pick up your hat by grasping it at the front and back of the brim. Always handle your hat with clean hands to avoid transferring grime to it. Allow wet hats to dry naturally. If you get caught in a rainstorm and your hat becomes soaked, allow it to dry naturally; artificial heat from a hair dryer or heater can distort or shrink the hat. Turn the sweatband out and place the hat on its brim on a towel to avoid creating flat spots on the crown. Shape the hat to its proper form; a wet hat will dry in the shape you leave it in. Try to avoid ever getting a straw hat wet, as the moisture will cause the straw to swell, distorting the hat’s shape. Never leave your hat in your hot car. Heat and sunlight can dry out, fade and shrink your hat. So don’t leave it on your dashboard or in your trunk, or sitting in front of a window at home. When your sweatband gets wet and oily, flip it down to let it dry out. This allows the perspiration to evaporate instead of soaking into your hat.